Toronto Raptors star Kawhi Leonard will miss his second straight game on Monday. The 27-year-old will not play in the Raptors' matchup with the Jazz in Utah because of a sore ankle, the team announced. Leonard also sat out Toronto's 121-107 win over the Los Angeles Lakers on Sunday. The Raptors star tweaked his ankle on Friday in a victory against the Phoenix Suns. Raptors coach Nick Nurse and Leonard have both previously said they do not consider the injury serious, according to TSN. 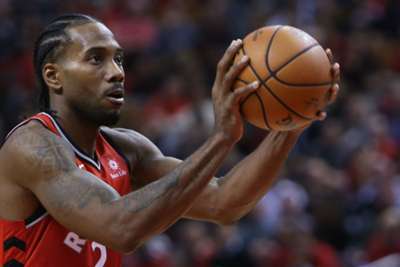 Toronto plan to be cautious with Leonard to start the season as he was limited to just nine games with the San Antonio Spurs in 2017-18 because of a quad injury. "The plan is for a little while here to not let him play [both games of] the back-to-backs," Nurse said. "I don't think we've decided how long that's going to be yet. We're going game by game." Leonard is averaging 26.1 points and 7.6 rebounds per game in his first season in Toronto. The Raptors are out to a 9-1 start heading into the game against the Jazz.